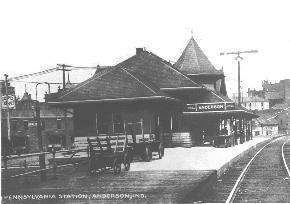 The Anderson Herald-Bulletin issued a call for people who remembered the railroad stations in Anderson when they were still being actively used by passengers going and coming. I immediately sat down and wrote this on August 26, 2000. I joined the U.S. Navy in 1959 and was sent to RTC Great Lakes (Recruit Training Center) for my initial training. At that time, the passenger trains of the individual railroads were still running and you could board the New York Central for Indianapolis or St. Louis or Cleveland. You could even take it to New York if you wished all from the Big Four station on Main Street. The Pennsylvania Railroad ran from Cincinnati to Chicago and that is exactly what I needed when it was time to come home on Leave. In fact, when I left RTC Great Lakes and moved across the road to NTC (Naval Training Center) for my electronics schooling, I rode the Pennsy at least once a month from Chicago to Anderson and back. The Pennsylvania station was on the hill at 9th and Fletcher. Down by the 'tunnel' (underpass) was at least one bar and across the street was what had been good hotels in better days. My mother and father would meet me at the station at 4 or 5 in the morning when I came in on Friday night and take me back to the station on Sunday afternoon to catch the train back to Chicago. I remember catching the 11 PM train out of Chicago Union Station. As part of it continued on to Florida after reaching Cincinnati, it was long and I would walk through the steam swirling in the lights of the platform looking for my coach in the hustle and bustle of travelers and porters and Red Caps. Trains were heated with steam from the engine back then. The train carried both sleepers and coaches and when I found my coach, a Conductor would check my ticket to be sure that I was where I was supposed to be. I then found a seat and settled in for the trip. I always had trouble sleeping until after we were moving and leaving Chicago. Other travelers never seemed to have that problem. They could drop off almost immediately, but I liked seeing the city at night as the lights flashed by as we would pass the grade crossings and home and factories. As we began to move through the darkness, a Conductor would come through and punch our ticket and after a while, dim the lights for those who were sleeping. And then there was the almost gentle rocking of the car on the tracks as we moved through the night and I would occasionally rouse from sleep as we went through one town or another. When we came nearer to Anderson, the Conductor would come through the car announcing the stops. "Elwood. Next stop, Elwoood," and "Frankton. Next stop Frannkkkton," and then I was home pulling past Cross Street and across Broadway and slowing for the passenger station. Through the night, the lights of the PRR station seemed to welcome me as I peered out the window looking for my family. The Anderson sign on the end of the station would come into view and my family was there looking for me with a big wave and smile as they spotted me through the large glass windows of my coach. A conductor was always at the door helping us to dismount to insure that all of the ladies and gentlemen left the car safely. As our family greeted each other and headed for the car, there would be a brief flurry of baggage and mail handling. Outgoing had all been on carts waiting at the proper location to be load and unloaded. By the time we drove from the lot, the Conductor would be calling his 'All Aboard.' Soon the throb of the diesel motors would increase and the train would pull swiftly out of the station Southbound carrying still sleeping travelers heading for points south and vacations in Florida. The few remaining people on the platform would move away and the station would once again be still. In the dark of night, it was difficult to see the faded condition of the Pennsy station and equipment. Then, all seemed well with the world and the railroads as dawn was breaking as we drove home. PRR Anderson Station photo reproduced from an early 1900s postcard - from the Roger P. Hensley Collection.